Backbends can seem intimidating, but you don’t have to be a contortionist or drop into a Full Wheel from standing to reap the heart and chest opening benefits this pose delivers. Possibly the hardest part about backbends is that they go against the natural way we hold and move our bodies. We slouch forward and move forward; backbends take us the opposite direction. They force us to be a bit vulnerable—essentially removing the shield that protects our hearts and emotions. Here are five great yoga backbends for beginners to start with. Lie on your stomach with your hands planted under your shoulders. With your gaze immediately in front of you, press up to arch your back. If this is new to you, keep your arms bent and your gaze forward. For a little more intensity, press your arms straight and begin to bring your gaze toward the ceiling. Tip: Be sure to keep your shoulders down away from your ears and your spine lengthened. Watch that you’re not tightening your buttocks; the focus should be the back and front body. Starting in Child’s Pose, reach your arms out in front of you so they’re straight. Next, lift your hips and if you can, extend your chin forward so it rests on the ground. You’ll feel a strong opening across your upper chest and your back. Tip: The further forward you can extend your body, the more you’ll feel everything open and stretch. 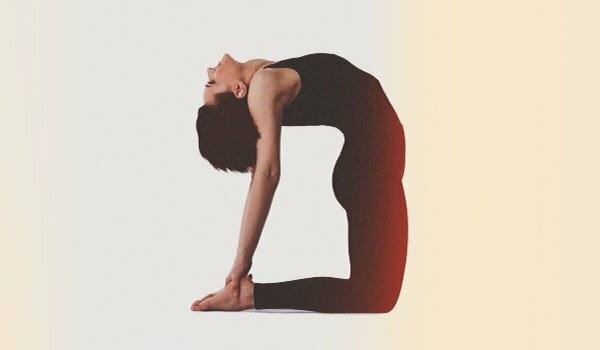 Bow Pose puts your body in a position similar to a backbend, but without the strain on your legs and shoulders—and it’s a little less scary. Lying on your stomach, bend your knees and reach behind you to grab hold of your ankles. Pull your ankles against your grip to lift your body off the floor. Tip: The more you pull in opposite directions, the more space you’ll get between you and floor. Pay attention to your neck; keep reaching your head up so the back of your neck stays straight. This position is also a great massage for the internal organs. Lying on your back with your knees bent and hands along your sides, raise your hips toward the ceiling. That’s the basic bridge. You can get an even stronger chest opener by reaching your hands under your body and clasping them together. Tip: One key in this pose to is keep the hips moving up and forward. It’s also extremely important to keep your head straight and remember to breathe deeply in this pose—and enjoy the opening you get from it! From a kneeling position with your body straight up and down, knees hip distance apart, reach behind you to place one hand on your lower back, heel, block, or floor. Now do the same with the other hand, and allow your head to extend back so your body is arched. Hold this for three to five breaths, feeling the entire front body open and expand. Tip: Your neck should be relaxed so it’s not straining, but with enough engagement so that it’s not just hanging. This is a challenging posture for many reasons, so try it and remember to breathe. Yoga backbends can be challenging and are not always the most comfortable postures when you’re starting out. But these more gentle approaches to backbends are a wonderful way to ease into these types of poses. I encourage you to challenge yourself; with time the fear will subside and you’ll feel stronger and more confident to go deeper in your backbends.